Joro, Shaylyr, Nyn, Zara and Truer are all at their camp. “Doren and Brisk Leaf should be back by now…” speaks Truer. Just then, Brisk Leaf enters the camp, sets his long ash bow down, and sits at the fire. “Here…” Zara hands Brisk Leaf a wineskin of water, and a stick with animal freshly cooked upon it. “Thank you Knight…” he replies, Zara nods and continues to cook another for Doren, who has yet to show up. “We must find him at once…” speaks Shaylyr who stands suddenly, his silver, white armour gleaming, and yellow tabard flapping in the slight post sunset breeze. “No need for that…” Doren suddenly appears, and speaks. He then sits at the fire, where Zara gives him a stick of cooked animal and a wineskin of water as well. “Thank you woman…” he speaks. With this Zara starts for her sword, but Nyn grabs her hand, and shakes his head at her. 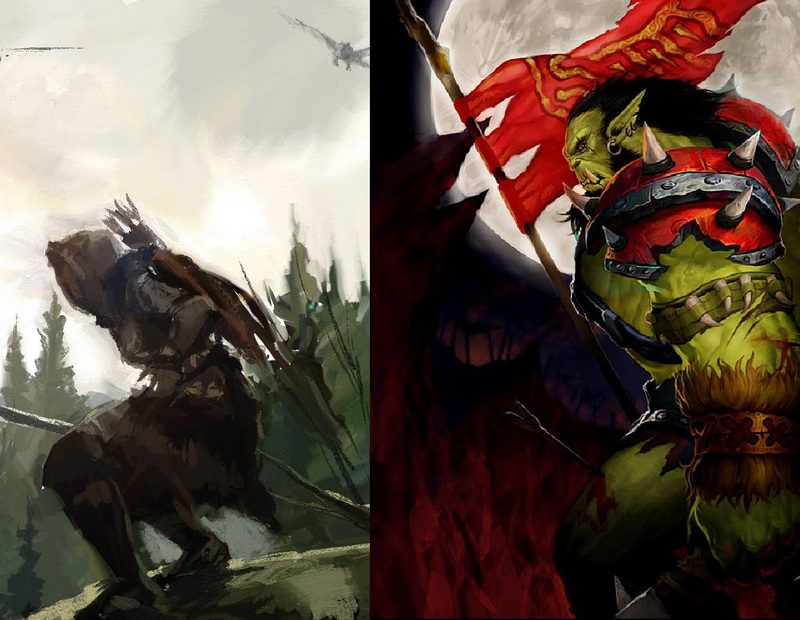 Truer, Doren and Brisk Leaf go on to explain how a Magic Wielder by the name of Yo Pre Ghado, camps with 60 Dark Warriors, and enlists a small party of Trolls… And how General Zai Zai Qed will be there by nightfall. “Very good… What is our plan?” speaks the Paladin, and Joro and Nyn smile slightly at Shaylyr’s zest. “Wait?” speaks Zara impatiently… “Why did we come here if we’re to do nothing,” she finishes. “And their scouts? And lookouts… Will they not detect our presence…” questions Nyn. “Not on your life,” interjects Doren with a gleam in his eyes. “Doren’s right… We Rangers will maintain a stealthy, yet fairly safe distance and continue to report back to you as you follow from a still safer distance,” explains Truer. “Hmm…” Zara huffs, stands, and moves to her sleeping spot. “Very well…” replies Shaylyr as he too stands, “…we’d best get our rest then… I–” he is cut off before finishing his last sentence. 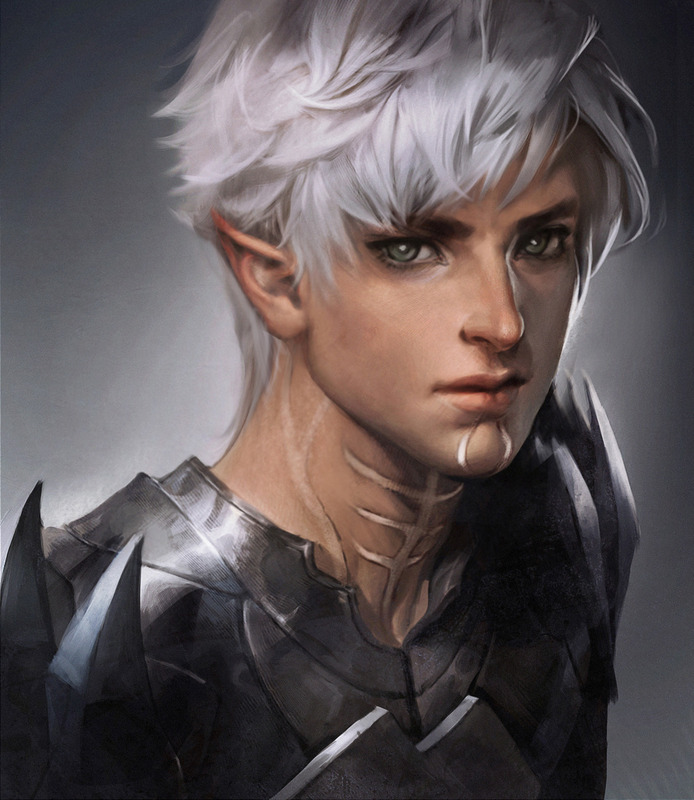 “I’ll take first guard,” Doren suddenly interjects, and stands enthusiastically. This grabs Brisk Leaf’s attention, but he makes sure not to gaze unnaturally at Doren. 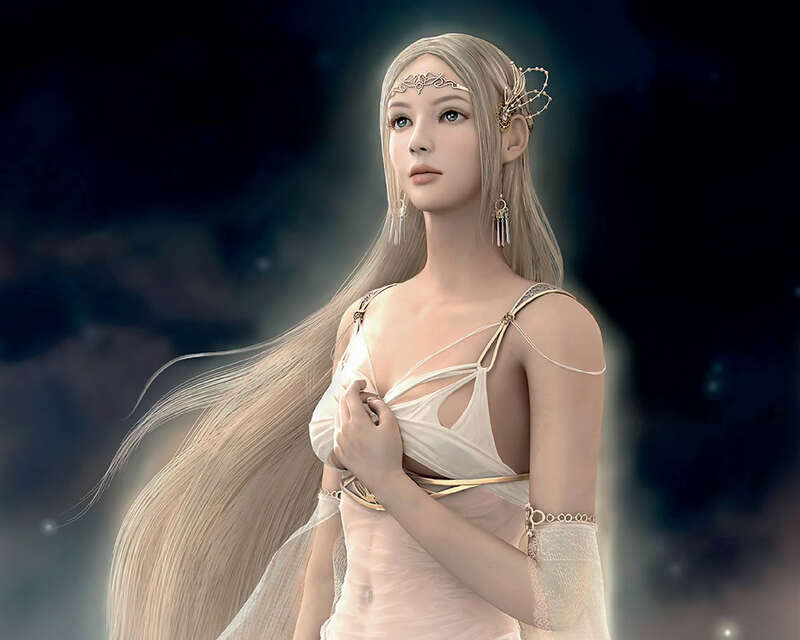 “Very well… I the second,” replies Shaylyr. 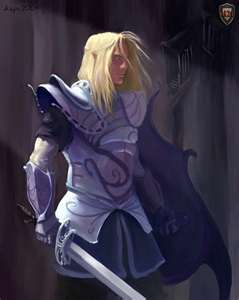 Shaylyr then heads to his sleeping spot, and takes off just enough armour so that he might rest a bit. Joro finds a s pot to read by a tree, and Nyn finds a sleeping spot as well. Doren gayly grabs his sword and starts a bit of a perimeter around the camp. Truer catches Brisk Leaf watching Doren as he goes. “What is it Brisk Leaf…” speaks Truer. 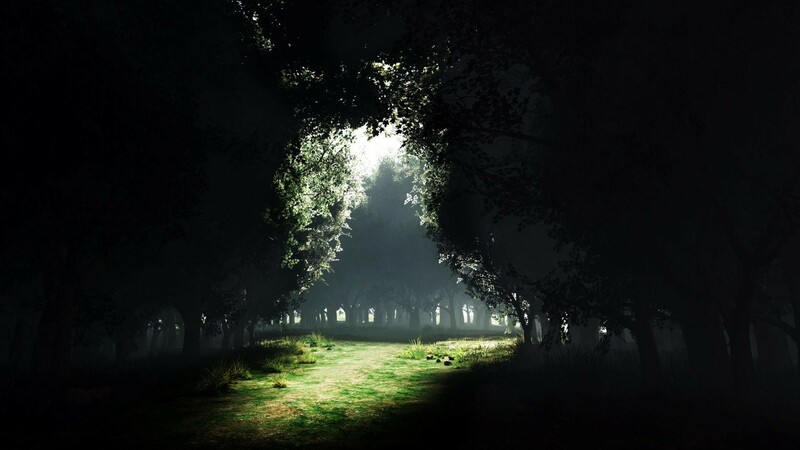 Brisk Leaf is startled by Truer… “Nothing…” he replies, as he then makes his way out of the camp into the shadows. Truer wonders for a moment why he’s going outside the camp, then lets it go, and finds his place to sleep. “Here…” announces Nyn just audibly enough to be heard, as he points at a purposely broken branch, left by the Ranger Doren. “Will this journey never end,” complains Zara, as she hacks her way through some of the branches around her. “Are you sure you’re a Knight?” questions Joro in jest, as he reads contently his book of magic, letting his steed lead his way. Zara gives Joro an unfriendly glance, followed by a quarter smile. It’d been a long time since she traveled with a party of any sort… She was a loner in the truest sense of the word. “Tortured…” she inadvertently spoke quietly under her breath. 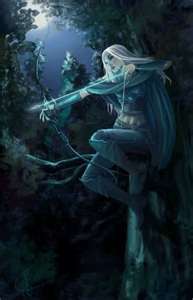 Thought Nyn to himself, then continued his movement forward through the woods, his long elven ash bow strapped securely to his back, and short sword drawn and hacking away. “Here me brothers! The time has come to shift the waking world in our direction… You and your people will be wiped out if you do not move beyond your meager ambush tactics… I bestow upon you, ‘ambition’… Something that your kind lack…” the trolls do not look pleased by these words, but they are 6, surrounded by the 60 some odd Dark Warriors serving Yo Pre Ghado. “HRRRAHH!” exclaimed the Dark Warriors, where as the trolls merely looked about, overwhelmed by this ‘interactive’ manner… Thus was not the Troll way. 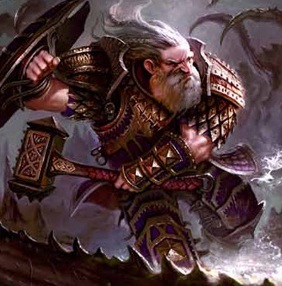 Watching in the distance, is Doran, one of the three Rangers employed by the Paladin Shaylyr, and his party. “You really shouldn’t ease drop brother…” suddenly a voice that sounded… Well… Exactly like Doran’s own came from behind him. He began to sweat as he slowly turned to face this mysterious figure who seemed to appear out of nowhere… Dorn’s dagger was drawn low. 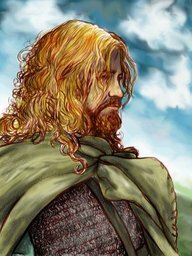 “Naytonan…” spoke Doran quietly, more to himself than to the figure standing before him… A doppelganger. The mimic stood staring at Doran with a menacing grin, his sword held high above his head. For he was a Halfbreed… Unaccepted by either. His hair of grey, and Eyes of green. 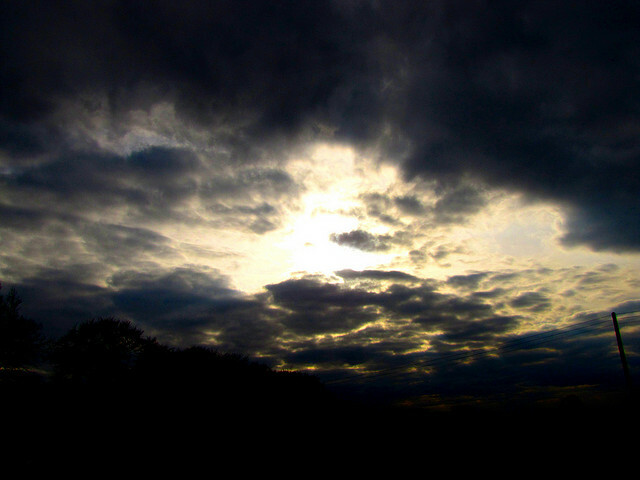 But as the years would pass, the skies below, where he had come from, to the south… Began to blacken more and more. After all… What good was a halfbreed to the World Below. “They were the Greatest Miners, and Strongest Warriors of their kind…” the halfbreed Ronah thought to himself. There were no Elves here… There were no Dwarves either… This was very strange indeed. “Something to drink or eat sir?” she spoke most unenthusiastically. 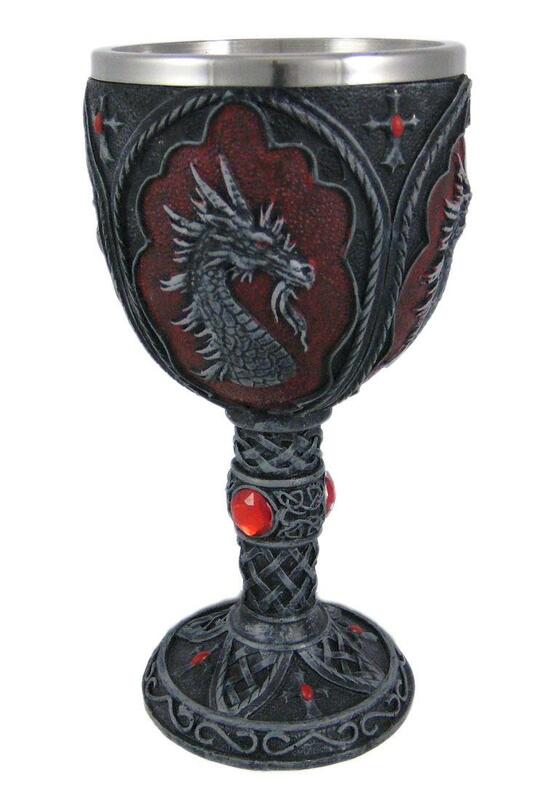 “Some Dark Red Wine if you please…” he spoke to the girl, pulling his hood off, and exposing his halfbreed visage. But it was too late, suddenly 3 black garbed Borduc Warriors approached Ronah’s table, pushing the girl aside. “Well, well, welll… What have we here” spoke a tall, large man in a grizzled black beard. “I don’t want any trouble” spoke Ronah, whose eyes looked to the girl, who seemed to be alright. “Look at that… He’s a halfbreed… As if the Pure Breeds aren’t bad enough” spoke another shorter, brown haired Borduc Warrior. “What happened to the Fynlaian Forests? Why, and how is it that they are burned to the ground” asked Ronah in an almost royal tone. 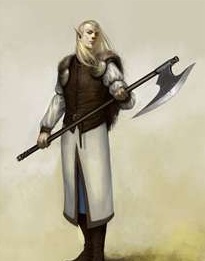 “Looky here… The Halfbreed wants to know what we did to the Fynlaian Elves, Ha!” spoke the blond haired third Warrior. Ronah started to take note of the Borduc Warriors all starting to gather around his table. That’s when he drew his two Swords, and climbed on top of his table. 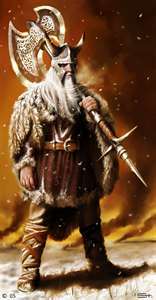 “IS IT TRUE THAT YOU MORTAL MEN HAVE ENSLAVED THE OSTADON DWARVES!! AND IS THE BURNING OF THE FYNLAIAN FORESTS ALSO YOUR DOING!! SPEAK UP!! OR ARE YOU COWARDS! !” Ronah shouted to the Borduc Warriors surprise. Meanwhile the blond girl hid behind the Tavern Bar watching, hardly able to believe what she was seeing. Despite how most Stories are told, not all Elves live in trees. In the far Village in Rodomor, lays the quaint home of Largoth. 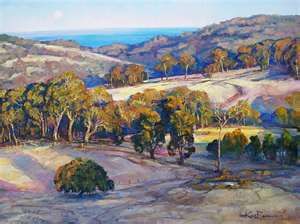 And though he is not a rich man, his family lives a peaceful life without much ever amiss. As Largoth likes it. 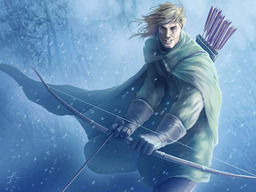 “Look Father, I’ve become Masterful with the the bow…” tugged Largoth’s youngest son, Alaynon. “Come at me Father, I shall topple you!” ranted his oldest boy, Fleenon. Often the Dark Rider has believed that the life of a Mercenary, always on the road, is somewhat safer for Largoth than being home with his two boys. Dark Rider watched as Largoth had successfully disarmed both of his boys, and was holding them down, both unable to escape. “I’m not impressed boys… If you really want me to come home more often, you’d best give me a bit more of a challenge when I arrive!” he gested. The Dark Rider often looked the direction of the Road leading into the village, wondering when his Party might arrive. At long last the boys escaped Largoth, and Alaynon called out to the Dark Rider. “Uncle Dark, care for a wrestle?!”. The Dark Rider looked over and smiled slightly, then back to the road. Largoth seeing his friend lost in thought, motioned for the boys to go inside. “Go help your Mother with Supper” he told them. He then approached the Dark Rider. “They’ll be here soon… It would take more than a mere Arrow Shaft to take down the likes of Iloh…”. “Hmmpf” Dark Rider grunted in reply. It was the next day when Elsya and Ems finally arrived, but there was no sign of Iloh nor Ukorian. “Greetings Dark Rider… Largoth” Elsya spoke as she approached them in the stables, where Largoth and he had been discussing Horses. “Iloh? Ukorian?” spoke Dark Rider. Em’s then stepped forward. “Iloh healed well enough, and the two of them went on their own way… Iloh said you’d understand” spoke Em’s. 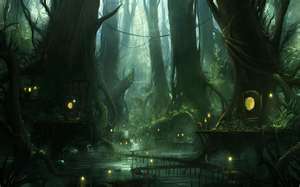 “Hmmpf” replied Dark Rider, as he headed towards the warmth of Largoth’s home, nodding at Elsya as he passed. “Come, lets get you some hot stew, and set yee in front of the fire, old friends… Tell me of your Journey” Largoth expressed warmly, as he tossed each of his arms around the two of them, and showed them into the house. Inside the Dark Rider sat in front of the Fire, staring deep into it’s embers. Elsya approached, and sat beside him. He nodded at her once more. “Did you love her…” she bluntly asked. With this he looked at her. “Hardly time for love in this world…” he spoke in a hardened tone. “I know of your lost love…” she continued. He looked at her “That was a long time ago…” he spat. “Oh… Not so long” she stood, and walked towards the others. At first he grumbled more “Hmmpf”… Than found his eyes wonder over to her, only to meet her gazing right back… Deeply. With this her Eyes went from a Light Blue White, to a Deep Lavender. Inside of him, something shifted, and part of his pain took flight, and lessened. As the Dark Rider, Largoth and Corwick’s Daughter Dylia made there way into The Fallen Wood… All was cast with an uneasy quiet. Even the White Owl flew Above the Wood itself. No good would be found here, and the sooner they got through it the better. Though The Dark Rider himself did not seem overly concerned, Largoth and Dylia seemed exceedingly alert. 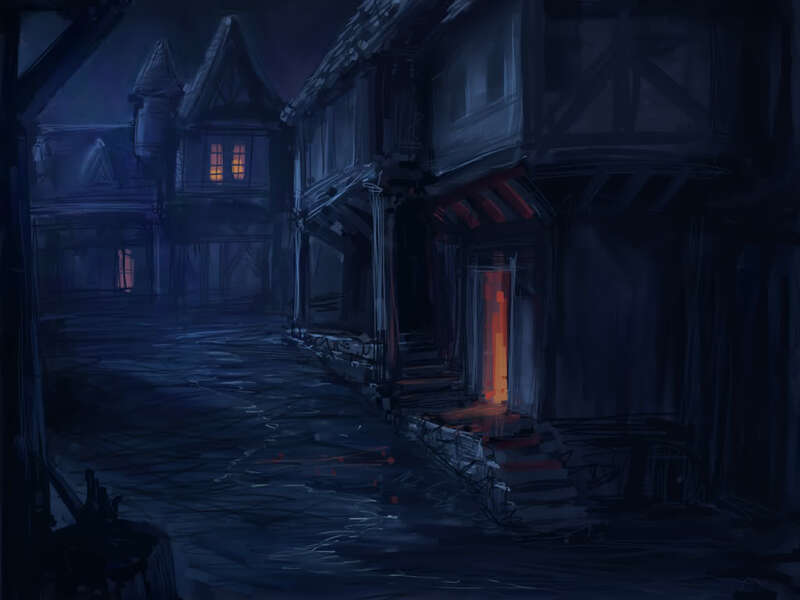 “This place makes me uneasy…” spoke Largoth. Hearing this did not please Dylia. 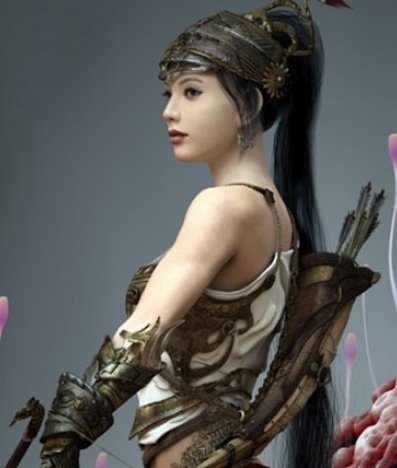 “Perhaps it’s time I armed myself” she spoke, stopped, and started to put on some Warrior Gear. “How’s this…” Largoth looked at her and nodded. The Dark Rider was not as easily impressed. “Eh…” he replied. Dylia smiled “You don’t like a Woman that can defend herself, eh… Might put you out of the Hero Business”. The Dark Rider did not dignify this with a reply. As the Nighttime Fell Upon them, the Forest seemed to swallow them up. It was at this point that they came across the Elven Village of Nah. “We’d best move on, The Elves of Nah will not appreciate us being here” spoke Largoth. “Hmmph…” the Dark Rider replied. And so they kept moving. Near the midnight hour, they decided to stop and make camp, being they weren’t likely to make it out of Fallen Wood before morning, it was probably best that they traveled by day. Though it wasn’t much Lighter during the day. “I’ll take First Watch” Largoth spoke. “No, we’ll do only one watch, and then move on… I’ll take the watch, you get some sleep… Both of you”, and so Largoth and Dylia went to sleep as best they could. It wasn’t until late into the Night that “whack!” a rock hit the Dark Rider on his shoulder from above and behind him. He was surprised to see an Elven Woman up in the trees. 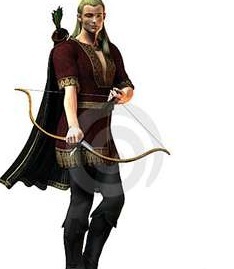 Apparently she had tossed the stone at him to get his attention, as she motioned with her Bow off in the distance, indicating he should make his way over there… And quickly. He did not hesitate. By now a solid Snow had Covered the ground. As he made his way through the thicket of wood beyond, the Attack Came. “TIME TO DIE LITTLE MAN! !” it was the Man Golem. The Dark Rider was quick to draw his swords. SWOOSHH!! the Golem Swung his Giant Axe. But the Dark Rider was much too Agile. “Back for another round, eh” the Dark Rider spat. “YOU WILL GIVE ME THE GIRL, THEN MAYBE OGO LET YOU LIVE! !” SWISHHH!! the Golem swung at him again. 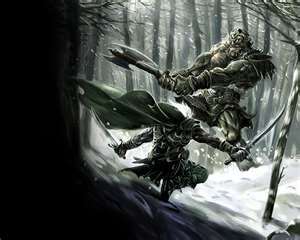 Suddenly several Arrows Struck the Golem, as the Elven Girl in the trees aided the Dark Rider. He looked up and nodded at her when– THUNKK!! the Golem shoulder first knocked him against a tree. “Ouch… Ok, that hurt” as he slumped to the ground. VOOMP VOOMP VOOMP!!! several more Arrows strike the Golem, and suddenly Lagroth and Dyria were there and stabing at him. “ARRGGHH! !” it howls as it attempts to gimp away, but the Dark Rider would have none of it, as he tossed both of his Blades into it’s back, and it fell dead. SCREECH!!! the Dark Rider looked back behind to the trees where the Elf had vanished, and the White Owl Toar away.